Royal Caribbean has cancelled all shore excursions requiring a ferry ride in Mexico today, following a safety warning issued by the U.S. State Department. Guests aboard Liberty of the Seas and Allure of the Seas recieved notices that their shore excursions scheduled to take place on Friday, March 2 in Cozumel were cancelled. 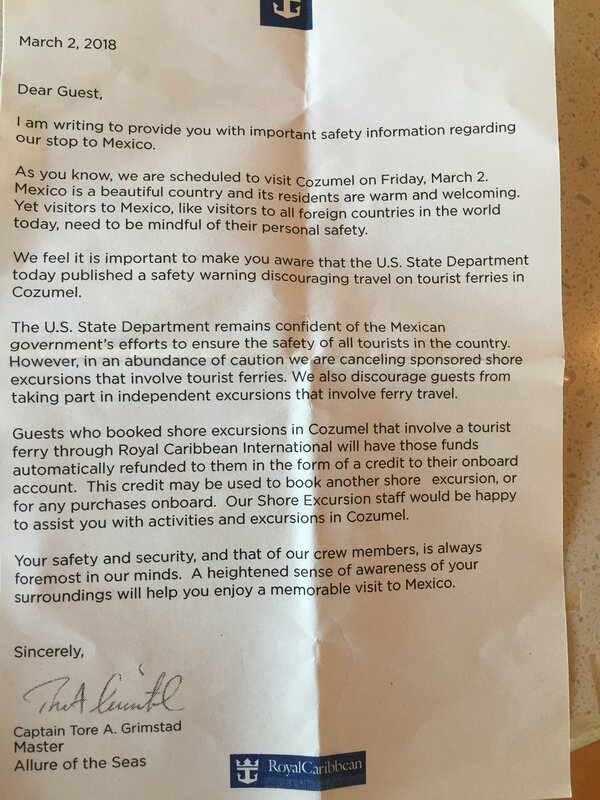 Royal Caribbean informed guests of the new State Department warning, which discouraged travel on tourist ferries in Cozumel. The letter adds, "The U.S. State Department remains confident of the Mexican government's efforts to ensure the safety of all tourists in the country. However, in an abundance of caution we are cancelling sponsored shore excursions that involve tourist ferries. We also discourage guests from taking part in independent excursions that involve ferry travel." We reached out to Royal Caribbean to get a sense if this cancellation of shore excursions involving tourist ferries will extend to other scheduled stops in Cozumel, but have not received a response.